For years, veteran Squidoo lensmasters have been tearing their hair that some thin-content, “pile of links” lenses get promoted, showcased on the front page of Squidoo, and earn payouts, while more content-rich lenses like this sink in lensrank until they fall into WIP mode, get noindexed, and thus become invisible to search engines, cutting off their traffic. So we should be happy that Squidoo HQ has raised the issue that we have raised for years, although I feel bad for the targeted lensmaster. But here’s the catch. 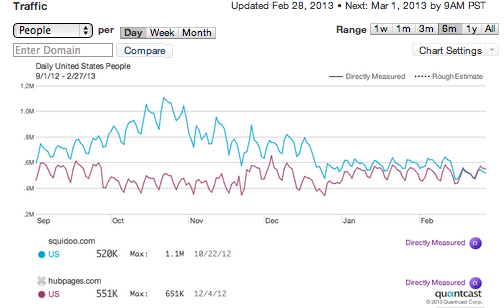 Prior to HQ’s Feb 27 post, what we see is the natural, organic search traffic the lens was getting. It drew daily traffic, for all that it was a pretty thin-content page. So apparently some people were finding it useful, or at least finding it. 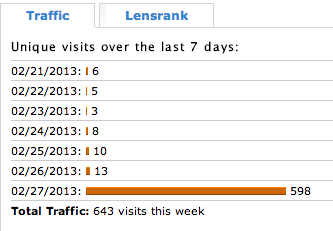 Ironically, all the visits sent by HQ’s blog post precede a next-day lensrank tumble. I suspect that some kind of manually-applied lensrank penalty may be at work, so we can’t draw general conclusions from the tumble. But before that, we see that a thin-content, “list of product links” lens can naturally rank in the 15K-14K range, whereas thousands of lenses with more substantial content rank lower. Other Squidquests award points for people nominating lenses in various categories for purple stars, and so people look for and nominate random lenses in various categories to get points. Purple stars provide lensrank boosts. ETA: When “Monsters” were added to Squidoo in fall 2010, it changed the thrust of the site from publishing content and earning readers to gaming and earning points. Is it any wonder that content has suffered, while gaming the system has increased? (Remember, before monsters were introduced, likes and blessings were anonymous). I’m not sure which of these factors is signficant, and which are just offensive to our sensibilities but fail to have a real impact on lensrank. HQ is in a better position to judge. The bottom line is that the top tiers are saturated with lenses similar to the one held up by HQ as “Never do this.” These lenses set an example of what earns money on Squidoo. Lensmasters see them, see what gets rewarded with a good lensrank, and imitate, imitate, imitate, trying to capitalize on the same success. At which point, telling people “don’t do it!” is like wagging a finger at athletes not to take performance enhancing drugs when many news headlines, awards, and good salaries are going to stars taking performance enhancing drugs. Nothing will change until you make sure the problematic behavior is not getting rewarded. Translation: Blame the lensrank algorithm, not just the lensmasters chasing it. And fix it. There are bigger forces at work here, however. I can’t help but see Bonnie’s post in the larger context of what’s been happening on Squidoo lately as a whole. Look at mid-February. This is not a typical traffic pattern for Squidoo; in past years its traffic has been fairly steady from January through March. This means that something has happened in the past few months. Either Google has done a massive algorithm change — in which case we’d be hearing about it across the SEO blogosphere and on these Google timelines maintained by Sistrix and SEOmoz — or some sort of recent changes on Squidoo have caused it to fall out of Google’s good graces, after years of navigating the stormy waters of Panda and Penguin without a wobble. Are spammy lenses like the one Bonnie just fingerpointed a new phenomenon on Squidoo? No. They’re annoying, and they’ve not helped Squidoo’s reputation, but Google has never given Squidoo a hard time about them before, because Squidoo has a lot of meatier, in-depth content, too. So, if those aren’t anything new, what is new on Squidoo? The biggest recent change has been Squidoo’s responsive layout redesign. Starting in December, Squidoo redesigned the website, hoping to make it more mobile-friendly. Many lenses actually became less mobile-friendly as a result, since hand-coded layouts were mangled by the change. Lensmasters have needed to go back and fix these layout problems manually, and many lenses— perhaps thousands— have not yet been fixed. The responsive layout often pushes sidebar ads down to the bottom, then adds more ads to the body text area of the lens, between paragraphs and modules. This occurs not just on mobile devices, but even on very wide screen monitors and large browser windows which previously accommodated Squidoo’s sidebar and body column. I’ve also seen extra advertising appearing at the top of lenses on my tablet. Too much “above the fold” and intrusive advertising causes websites to be downranked by Google’s “Top Heavy” algorithm. I’ve argued since 2011 that Squidoo’s inefficient use of “above the fold” space risked incurring this penalty, yet I was wrong: somehow, Squidoo always managed to squeak by. But now that we’ve got ads smack dab in the body text of the lens — where Hubpages has always had a block of ads, and until now has always fared worse from Google than Squidoo has — Squidoo’s traffic levels have fallen to Hubpages levels. Coincidence? Also starting in December November, Squidoo became a Crowdignite affiliate (see Google’s warnings about Link Schemes). This did three things. Crowdignite links now replace the “Related lenses” box in the sidebar of Squidoo lenses, unless we specify “related lenses” manually. So before, Squidoo lenses cross-linked to good on-site content that was relevant, boosting relevance on both sides of the link and keeping pagerank within Squidoo. Whereas now, most Squidoo lenses cross-link to CrowdIgnite content that may not be as relevant and which siphons pagerank away. This is a huge SEO change. Crowdignite and Squidoo are basically creating an artificial traffic exchange. It’s not a paid traffic exchange, which would likely incur some kind of penalty, but it’s not something that Google recommends. Moreover, to hold up its side of this traffic exchange, Crowdignite takes and republishes Squidoo content elsewhere. This means the content we post on Squidoo is no longer found only on Squidoo. I don’t know where CrowdIgnite is redistributing our content, or how much of Squidoo’s total content is being duplicated on CrowdIgnite’s other affiliate sites. All we know is that CrowdIgnite is duplicating lens content off-Squidoo. Duplicate content, folks. Again, I can’t be sure this has anything to do with Squidoo’s recent traffic woes, but the timing is suspicious. However, I don’t know how to test whether this duplicate content, Crowdignite’s traffic exchange, additional ads, or layout problems are in fact causing Google to downrank us. Those are just educated guesses, based on my knowledge of what kinds of factors have gotten other sites clobbered by Google algorithms in the past. So how does this tie back into Bonnie’s post about spammy sales lenses? Squidoo has a traffic problem. Its traffic and revenue are falling. I was waiting to see what kind of steps HQ was going to take to address this problem. While I worry that too many thin-content lenses like the one Bonnie fingerpointed could lead to Google penalties, they have been part of Squidoo for years and have not cost Squidoo.com any Google rankings; they simply took away Squidoo tier payouts from other, possibly more deserving lenses. Whereas now, it looks like something else is costing the site Google rankings. I hope HQ is investigating what that “something else” might be. Posted in: Never Do This. 2) The rewards. There should be a balance between what encourages lensmakers and what produces revenue. Adjustment of the lensrank algorithm to achieve this would de facto render much cheating irrelevant. 3) Ancillary activities. As you say, page structure, content and technical aspects. 4) Squidoo’s own decision making and review processes, assuming there are any. Unfortunately I sometimes wonder if anyone at Squidoo is really in charge anymore. As for the responsive layout, I am the current owner of a few very ugly looking lenses that would make me hit the back button if they weren’t mine. I did damage control on most of my lenses, but I know a few that needs a lot of work and I just don’t have time to fix everything. Thank you for this. I have been concerned that traffic has tanked 50-60% since the Autumn, according to Tom, “good new lenses” are experiencing no such problems…. This is not felt to be true by the poor lensmasters concerned. On the contrary, it is the best content rich lenses that have tanked the most. Your take on it is much more believable than the “heads in the sand” statements we are all getting when we raise our concerns. If only “good new lenses” get good lensrank and traffic, and lenses lose their earnings potential before they’ve had time to accumulate royalties, the ROI potential of Squidoo is greatly diminished. Which is fine if you’re using the site as a hobby, but problematic for self-employed writers. I agree that some of the lenses must be hit hard for thin content and link stuffing, however I have to admit I found high quality lenses with thin content, written mainly by Giant Squids, which I found easy to follow, read, and navigate through. What annoyed me originally was that they rank very highly, I am talking Tier #1 for a 300 word lens, when my 2,500 word is stuck in Tier #3. However, I have to admit that it takes a lot of experience to be able to do that. I agree, to a certain extent. I ruefully noted above that the “Never do this” lens was actually getting daily traffic, which suggests that despite my own opinion of it, it’s doing something right. I understand that the audience for people buying shower curtains is probably greater than that for the “quality content” lens I linked to at the top of this page. It’s a dilemma. I myself have caved into it, creating 25 Funny Things on Google Maps — a glorified link list, for all that it really did take a lot of work to produce. 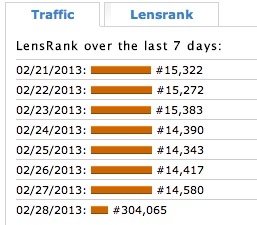 It’s now my top-ranked lens by a wide margin. Whereas for years, my top ranked lens used to be my personal diary about a trip to Greece. More people want to look at funny things on Google maps than to hear my ramblings about ancient Greece. And maybe more people want to buy shower curtains. Great post. Something is very troubling right now at Squidoo and I want to see it actually acknowledged by the powers that be…in the meantime I’m quite cautious about what I publish there vs. elsewhere. Once again I think HQ should be using you as a consultant Greekgeek as you’ve summed the situation up really well. This is another great incentive from HQ to get their lensmasters to diversify – I’m glad I’ve been doing that already! I had to bow out after a short time, due to homebuying and health stress. It is a lot of work! I do not envy them the job. As usual, you summarize the situation well. Today’s trial of removing the transfers is not the answer. Very smart analysis! There are some huge shakeups right now and, unfortunately, HQ is alienating some users rather than tackling needed changes in a respectful/partnership based way. Greekgeek, I have tremendous respect for your knowledge of Squidoo. The points you make in this post, I believe, are right on the money every step of the way. Your courage in putting this out there for all to see is remarkable. If you were on stage saying this, you’d hear loud applause from the audience, because so much of what you say is so very true. Thank you for saying what so many of us have been thinking. I’m not sure there’s any courage involved in being a gadfly and standing on a soapbox, but thanks. Thanks for the wonderful post. I don’t understand why they signed up with CrowdIgnite. Sometimes businesses grow too large for their “britches” and I’m worried about squidoo in that way. In the meantime, I’m earning more here than on another site, so I’m still here. But I’m not as invested as I used to be, making it easier to move if I feel that will be the right thing to do. This post makes such good sense, that I sincerely wish you were part of the HQ Team Ellen. It does seem to me that the team could do with someone with your knowledge and expertise on this topic. I heartily agree with your comment, AJ. Maybe we should all do as Natalie and send this article to Squidoo HQ. Excellent research and commentary here, well done Ellen. I think if Squidoo rewarded people more for external traffic rather than internal traffic and Likes etc, opened up the payment tiers to not only spread the wealth but deter cheating to get into the top tier, then things might turn around fairly quickly. I am under the impression that each of their new changes are just not well thought out, as well as not being part of a master plan to get Squidoo back on track. Quality over quantity is the best way to get a good reputation, and that means quests to generate good content, rather than pure sales lenses. The last 2 years they have been pushing sales lenses over and over, the more the merrier, with quests galore. Now they are saying that sales lenses need plenty of content. It’s completely the reverse of what whey have been doing. While sales lenses do make sales and earn income, quality content will ultimately generate more traffic and more income in the long run. I agree the changes aren’t thought out, seems like a series of knee jerk reactions. For example after the shower curtain lens owner commented on the first post that they had bought that one as a group of lenses, within a few hours all of a sudden no more lens transfers are allowed, and Bonnie is telling us to delete lenses”that don’t have anything to say”. Huh? Could you be a little more specific? You want us to start deleting lenses with no analysis, no rhyme or reason? Just pick some out of the sky and delete? Are you kidding? AJ printed somewhere recently that someone was asked in an interview who was in charge the response was something like “it’s a group effort”. That leads me to believe there is no master plan. Meanwhile I’m beefing up my SPAMMY lenses that have nothing to say. ;-). Oh and also writing some posts for my blog that were originally going to be new lenses. A truly excellent and insightful post, Ellen. My worry is that Squidoo will inadvertently punish many quality lenses with both keywords and content with this new program they’re developing. I hope they give us a warning before they decide to wipe one of our lenses off the board. As for your point about CrowdIgnite and the internal adverts, I agree with you completely. There is definitely more evil at work here than just spun lenses. I don’t think the responsive layout is at the back of this traffic change (though I still think it’s not that big a change year over year). I do think crowdignite probably is not helping. Those are followed links, aren’t they? Combined with the fact that my lenses and featured lenses modules are invisible to Google – the amount of internal links between lenses (other than the few in the categories) is minimal. Surely less than a site of this size should have. I agree with Katinka. The responsive layout is coming all over the internet including Blogger and many WordPress sites. That, I doubt, has much impact on traffic. I’m not saying responsive layout per se is the problem. I fully understand the need to make sites more mobile friendly and was sending emails to HQ about it over a year ago. Many members still haven’t gotten around to fixing them. So Squidoo as a while is probably getting a higher bounce rate now, due to all the visitors coming to broken lenses and leaving when they see a mess. I’m not sure whether Google can see the jumbled layouts, but it can see user behavior, thanks to Adsense. Right. Google ignores tags as far as, “Hey, Google! I’m telling you that my page is relevant for ‘blue widgets’ by tagging it with ‘blue widgets’!” However, as you know, tags are a powerful way of interlinking related pages on a website, and those links are counted by Google, so tags still have an indirect affect on SEO. Michael Martinez (gadfly that he is) argues that we have absolutely no proof that internal (in-site) links are counted by Google as less important than external (off-site) links. He argues that Google is all about relevance and editorial selection, and that internal links on a site that’s organized by topic represent a relevance signal. I don’t know. I do believe internal links are an important and overlooked part of SEO. I buy the idea that Google is not counting raw numbers of links, but rather, relevant links that have something to do with the search query. So a page that has links from and to topically related pages (whether off-site or on the same site) will tend to beat a page with more unrelated incoming and/or outbound links. *checks* Yep, CrowdIgnite links are DoFollow. So yes, multiplied across all of Squidoo, they represent a big change in its fundamental SEO, with thousands of links pointing away from Squidoo instead of reinforcing relevant pages on Squidoo. I’m not transferring lenses anymore but it’s ridiculous to cut that out now. Why? There’s no purpose to it. As for quality lenses, I always wondered why lenses with barely a couple of paragraphs and then nothing but Amazon modules were being showcased on the front page. Makes you shake your head. Squidoo was so much better when it was just starting out and there was good communication, input from the community. Hate to see the level of service running out. I believe the problem was that they have belatedly discovered the massive cottage industry of low-quality, spun content lenses being created and sold (which entails a lens transfer from seller to buyer). This chokes off the spun lens black market which — according to HQ’s post — has become a “rising tide” in recent months. I’m not convinced that’s the whole cause of Squidoo’s recent traffic woes, but I buy the argument that drastic measures need to be taken to stop it. At the same time I feel for legitimate lensmasters like Annie who were creating and selling good lenses: some people’s livelihoods just got axed. Banning lens transfers also makes it difficult to reorganize our own lenses via niche accounts if/when our main account gets to be more cumbersome. This is evidently a trial, emergency program for a month, during which HQ is soliciting feedback. There is also a form that members have uncovered which shows they are considering letting people apply for lens transfers manually, with a chance to explain the need for the transfer. I’m not sure if they have the personnel to manage that, but it seems like one workable solution. I would argue that it has cost Google rankings virtually by discouraging writers hoping to rank with great content. I’ve seen lensmaster after lensmaster drop out after finding it impossible to penetrate the clog of content-light lenses earning decent bucks on Squidoo. This is definitely true. Even I have “dumbed down” the content I post on Squidoo, focusing on buzzworthy topics and, yes, product reviews, whereas I started on Squidoo when it was a place to post educational, informational, and thoughtful content. I’ve stopped posting any of that, because I felt Squidoo was no longer a good fit for it. This year, I was planning to move my Greece Odyssey lenses off Squidoo — which Seth Godin has highlighted in the past as an example of what Squidoo has to offer. I still may do so, as I have fundamental problems with CrowdIgnite taking our content, but… yes. I would like to see Squidoo be a publishing platform again, not only an affiliate sales platform. Yep, it’s a bit disheartening sometimes to find my best lenses never get play but my little old lens on Toddlers and Tiaras is always getting hits. Go figure. I am a newbie. I am not a writer. I am just trying to make money to support a disabled Wife and 2 teen girls! I tried 5 lenses that never made it past the create stage! #6 got locked! I wrote one in anger not locked yet SURPRISE! I do believe from what I have read over the past several days and the one today(Spun content and the need to be human) that my 3 I have now will be locked/deleted as per that new filter. I just want to learn, and make money to live on! Get rich quick I know does not happen! I do not agree that the “Shower Curtain” lens is bad, some things do not need words to sell, just a Picture. I do not now where I will go if they get locked/deleted. I have yet to find any better system then here! The modules make it EASY to put a LENS/SITE up. I do not have the foggiest Idea how to promote. Can only rely on good key word content and search engine to find me! I don’t to put up something “Scammy” but I have to learn and if “Filters” are just going to lock/delete what I have worked on and am trying to improve on then there is no way I can learn!! SORRY it is long I have a lot more I could say but I wont! Doug, sorry you’re having such a tough time breaking in. Squidoo is a slow way to earn money. I think, if you need the money now, you probably want to start with something that’s more of a sure thing. But many of us have made it work, and we do try to share what works for us to help other newbies get started. Here’s my Squidoo Tips guide which may be useful. I also recommend AJ’s Squidoo Step By Step Guide (it’s free!). But you have to have real content — something to talk about, something to say, whether it’s a page about your passions, areas of expertise, or products you’ve researched or use yourself. What sorts of things do you know about that other people might find interesting or useful? Write on those things. Greekgeek I really do not know of another place that is a “start with something that’s more of a sure thing”(Has the easy modules that work so well) and the 2 about HDTV and Home Theater is what I got from research. I know that they need Improvement and I am slowly working on them. The third I don’t really care about as I said I wrote that one in anger. I have used/read your stuff. Your “My Amazon Links Beat Squidoo’s Amazon Links” is one of the best written ones I have found it took me 2 days to put it to use,(I am a little slow) and another to get those 2 Lenses to work right. Given time I will do better but only with practice which it looks like I might not get? Only time will tell? Everyone (Including you) who were here before November, were given that time and some people are faster then others! But the filters are getting rather stout! I joined May of last year. I had found and can still find “Weight Loss” Lenses I thought I could do the same! That’s why it took me so long to get one up to stay. All I am really saying though not very clearly, is if someone is new at this and is slowly improving, then some “Could Care LESS” filter should not be allowed to “Delete or Lock” a lens! I do not want to have what I am working on locked or deleted! I do not want to put out Lenses that people can not USE! And everyone is different as to what looks good and what looks bad! A filter DON”T Care! So for new People or really anyone, put up a yellow flag, then when the “Owner” fixes it or ask for a HUMAN to look at it, green light it or let them know how to fix it! I am sorry this is long. I do not know how else to try to get my point across. I can’t learn if I get kicked off now can I? I am someone who does not believe in punishing the hole class for what one student does! I agree with Douglas. I myself am new here and I first used to make content rich lenses that took me days of work but sadly they never made it and didn’t get me much income, then with the celebrate mag and quests, squidoo HQ was encouraging us to do sales lenses. some sales lenses I did contain small lines containing my personal opinion and recommendations for certain products or gifts for a certain personality or occasion. And not till I’ve seen respected lensmasters doing these kinds that I started doing them. but I do try to pick the best products in my opinion that go with the subject I’m addressing. some of these lenses even got a PR2 or 3 so now I don’t know what to do should I delete those lenses even though google itself says they are good ones or what? I don’t want my account to be terminated for violating the TOS and honestly I don’t think sales lenses if done properly are spamm and they don’t have to be full of contenet to be good sometimes a shopper is just looking for good ideas or products that will save him hours of search on his own. I would appreciate it if squidoo HQ gave a certain peridod in which they would flag the lenses they think are spammy but not block the accounts of the lens masters giving them time to address this problem and then if not adressed after a certain period the lens should be blocked. I’d love to know how exactly should I determine if the lens is considered to squidoo spam and if there are some clear criteria I could measure with because honestly, specially when it comes to gift guides and things like that a shopper is realy looking for new ideas or products that will appeal to him and save him long search time and it doesn’t need to have much content as the examples given by squidoo HQ. I honestly am looking for answers and would appreciate if someone would help me out here. I wish I had the answers. Unfortunately, a question like that really has to go to HQ, since they’re the ones who will draw the line. We can only speculate, which is not what you need right now. thanks for answering me I’ve already posted the same questions there on their post and I’ll checkout if they answer me. Or is there an email address I need to send to? Thanks again for your quick answer, it’s much appreciated. I am pleased that GreekGeek has said what many of us have felt for a long time about rubbish lenses getting Tier 1 status. SquidHQ should not be afraid to make changes and make them retrospective. Not to do so would dilute the effect of the changes to the extent they would be toothless and pointless. I am not sure what kind of test you could apply to deter lensmasters from making ‘thin’ lenses that are mostly ads. Maybe a Plexo style page that we can all visit showing lenses published in the last 24 hours would be a good idea together with a way to ‘knock’ a lens that does not come up to standard. I suspect the only way the authors get away with creating lenses like this, is that they don’t put them up for criticism in the forums. The idea that you can buy favours from sites like Fivr is sickening. I might just run along there and name and shame anyone I can identify positively as touting in this nasty way. These changes and more to come may shake Squidoo to its foundations but it needs to happen or it will die of being choked by rubbish. Fantastic post, you have a great insight into what goes on ‘under the bonnet’. Being very new to all this, I’ve been totally dismayed by the events of the past 2 days, had no idea so much spamming and clicks for sale and all the rest of it was around, though I did wonder why so many lenses kept appearing highly ranked yet with very little content or actual gibberish, or ads for summer stuff in the middle of unrelated lenses. I have been spending all my meagre spare time trying to do really good lenses. I was prepared for it to be a long haul and knew I had to put in the effort to eventually build a small but steady income stream. But after all the revelations, I’m now thinking I’m on a hiding to nothing. You said you were thinking of taking your Greek lenses off – I’ve heard of Zujava and Wizzley. Do you know if either of them are a better bet? I haven’t really given Zujava and Wizzley a strong enough effort to be able to make a comparison yet, although I know good lensmasters doing both, and some swear by one site or another. I personally still find that Squidoo gives me the best average earnings per page, although I’ve had to adjust the kind of content I post on it (less educational/informational, more buzzworthy and popular culture, not to put too fine a point on it). If I do take my Greece lenses off, they’ll be going onto my own website. Note that that kind of content struggles to do well anywhere; some kinds of topics get searched more than others. Archaeology and mythology are never going to be as popular as, say, “Replacement batteries for my car’s smart key,” even if the former entails meatier content. Wait and see. I will say this: while I see a certain amount of flailing from HQ right now, it it looks like HQ sees there are problems and is now attempting to set the ship on a better heading. My travelogues used to rank in the top tier or second tier. Now they’re second, third or below. Ellen – How would you move content from Squidoo to your website without it being duplicate content? Rewrite the content? Or something else? I’ll delete some of the lenses, and others I may change to different content. (The original award-winning lens I’d change to an introduction to the website). Greek Geek, thanks for all your thoughtful and informative articles! Also, I know the income comes from the ads, but the layout just looks too spammy to me, with many pages having way more ad content than actual information. I need to make money online. I know I’m a good writer, and I have loads of interests I’m passionate about. Only problem is, they’re all things that are either massively high competition, or very niche, low competion but also low volume topics. I’m willing to work hard and produce high quality content regularly, but I’m wondering if that’s enough to get a newbie anywhere on Squidoo now. Still, only one way to find out and that’s to start publishing! Well, I wish you the best! There were very few ads when I started on Squidoo. It was a clean, simple interface that wasn’t the least bit intrusive. It seemed like the perfect place to post my personal recollections of visits to Greek archaeological sites and my amateur interest in volcanology. Over the years, advertising has been piled on top of advertising, and Squidoo looks different and pushes a different kind of content than was common when I started (when Jane Goodall– yes, THAT Jane Goodall — was an active member). Honestly, I wouldn’t have joined Squidoo if it looked like it does today; I would be slogging it out on Hubpages with my $60 a month paycheck, and it would still be a hobby rather than how I make a living. Yet, as much as I dislike them, those hideous ads form the bulk of my online income, and make all Squidoo members far more money than back when lens advertising was just a few Google adsense text links. HQ is now making a push for quality content, so maybe you’ll have a better chance than you did for a while! They need to have examples of good content to hold up. I normally don’t take the time to participate in quests, which are almost never on topics that work for me, but it’s worth glancing at the Quest tab from time to time to see if any of them ever fit. Also, they often have “like a whole lot of lenses on topic X!” quests. If you see one of those, and you write on topic X, take the time to share it wherever you share lenses — in the Lens Spotlight forum, on Twitter, or on Facebook — so that people looking for topic X lenses can find it. P.S. that Staffordshire Hoard piece is someone else’s. In a battle against the Squidquests’ push, push, push for more sales and shallow content, I created a “Squidoo Museum” lens to find, showcase, and support lensmasters and lenses doing the kind of work that I thought HQ was ignoring. That was one of ‘em! Unfortunately it was too much work for me to maintain the “Museum” lens, which never got much traffic and seldom earned a penny — and it was also growing increasingly difficult to find the meatier content I was looking for, since the lensrank algorithm tended to kick those pages into WIP unless their authors republished them from time to time. Fantastically helpful repsonse, and very appreciated, thanks! Thank you for this detailed analysis of the issues at Squidoo. I had not heard that Squidoo was working with Crowdignite. After reading the TOS, I am not very happy about it, either. I think I’ll take some time to really think about it. I earn as much or more from my Amazon affiliate links as I do from my Squidoo Amazon modules. It may be time to diversify and create my own site. I have the skills to do so, but many lensmasters do not. For that reason, and also because Squidoo is a quick way to put up content, I sincerely hope Squidoo HQ can get control of this situation without hurting too many lensmasters. Yes, it is their sandbox, but no, we do not have to play in it. Let’s see what happens. It’s a very interesting and well thought out post. Thanks for putting it out there. I do think that the format change in the last quarter of 2012, well intentioned as it was I’m sure, may have been mistake. The CrowdIgnite thing doesn’t seem to be well thought out either. I’ve certainly seen a drop in traffic since then. Squidoo is definitely changing. There are hundreds (thousands?) of new lensmasters who have found their way there as a result of various gurus recommending Squidoo and similar sites post Panda/Penguin. the recommendation usually comes with a “how-to” guide regarding producing lenses as quickly as possible. And you know what – if those shower curtain lenses are what the public actually want to see, so be it. If that is providing user value, then why not go for it? We can still produce our lengthy travelogue lenses (which I enjoy reading btw), but maybe not have much right to complain when ours don’t rank in tier one. And, on the subject of tiers, surely we have to ask what kind of behaviour does the Squidoo points system encourage? The recent changes, coupled with the points/level up system have brought us to where we are today. The internet is, like anything else, a moving target. Sometimes well intentioned acts go wrong. Time for a change of tack maybe? The issue of Crowd Ignite is one I’ve been raising from time to time but so far this has got zero response even when I asked direct questions. I would love it if HQ quit it. The reason these “thin content aka showercurtain” lenses rank better then more substantial more deserving constant is in my opinion a direct result of the greater Seo knowledge of the lensmasters who go straight for the $/hour. While hobbyist tend to ignore any technical hufpuff in a blind confidence their brilliant stories will soon find recognition in the eyes of everyone. I’m pretty sure stories can rank well but they are managed differently. For example they then forget to build 126 other similar lenses with similar stories to support it. However I totally agree and have written so with you that Squidoo’s algo is solliciting exactly the content they are getting. Currently I don’t care about the point system. It’s cute, I can imagine people who get busy can get a tier 2 out of it with a lot of work but I can’t imagine it being a sustainable way to earn a decent $/hour. Anyway I love the responsive design. Perhaps it needs finetuning? I really don’t know but it would be a bad move to give that up imo. I’ve seen you raising the issue, and I appreciate it. When CrowdIgnite was first incorporated into Squidoo, my main concern was that the right to redistribute, copy and rewrite our content was given to a third party without our consent. I came to realize that the SEO ramifications were as troubling as the ethical ones. Speaking of SEO, I think you’re underestimating a lot of Squidoo lensmasters, understandably. It’s true that the lens I held up as an example doesn’t have any SEO beyond latent semantics, although I gave seen from my own studies that pages with a lot of concrete, specific, “nouny” language like that can naturally get at least some long tail searches, if you don’t cut off the traffic by noindexing it as the lensrank algorithm did. So there is a ton of SEO being implemented and used on Squidoo lenses by members who have been doing this since the site began. Yet a lot of optimized content is being outranked in lensrank by content like the shower curtain lens — yes, I understand why it was able to get 5-10 hits a day, but its use of keywords was pretty basic — even when our content is getting more traffic, and possibly more targeted and converting traffic, thanks to SEO. In other words, you can have competent SEO and still get killed by the lensrank algorithm, becsuse it’s looking at other things besides traffic and conversions. It takes into account a lot of internal factors, and it weights factors like freshness as more important than who’s coming to the page and what they’re doing on it. FWIW, most of us care diddly squat for the points system and have long argued that it’s distracting both HQ and lensmasters from Squidoo’s originsl purpose, publishing content and getting readers. But they supposedly serve the same purpose that we used to — teaching newbies how to use Squidoo by introducing (unlocking) pieces of it in bite-sized chunks. As a teaching tool, I suppose they’re useful, but I believe that marrying likes and purple stars — both of which convey lensrank boosts — with quests and points has caused some problems with lensrank. Ellen, I do agree that the CrowdIgnite thing is concerning, Though I would of thought that squidoo must have weighed the potential loss in traffic from google penalising with the increase in revenue from crowdignite? This may well be a mistake and if they do see this connection, am sure this ‘experiment’ should end shortly. Google is tightening up on a lot of things related to ‘thin’ and ‘spun’ content and Squidoo will be on the frontline of sites that will get dinged unless they do something about this. 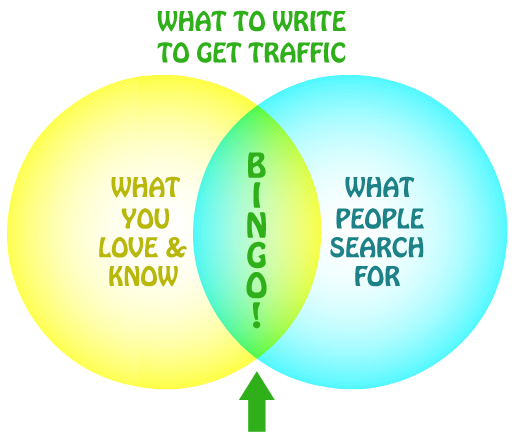 Currently most of squidoo’s success is due to how SEO friendly it has been, which has rewarded the writers there with great traffic. Though as googles algorithm gets more ‘intelligent’ and becomes able to spot ‘thin/spun’ content, this will heavily impact on squidoo, particularly if they are rating this type of content highly themselves. If the majority of ‘self-recommended’ content is thin/spun this will impact the whole site in a similar way to dropping in page rank. There are lots of media articles discussing one of the next evolvements of googles search in focussing on and rewarding good content and the authors of good content, and am sure that is the driving force behind squidoo trying to make these changes. One thing I noticed, before Novembre there used to be multiple squidoo pages in the serp top ten for a specific keywords. Now, you only have one page of the same domain in the google search page. This is true for all the domains , not only squidoo. That change alone can affect the traffic in a big way. I have had four perfectly good lenses locked, and two of those have now disappeared. Pretty discouraging for a newbie. Ouch. I would apply for a greenlight with the ones that are left, but also make backups. It’s a rough time in Squidland.